Citation: Goldenberg MP, Meter KA, Thompson OM. Tracking the impacts of farm-to-school purchasing programs. J Nutr Hum Health. 2017;1(2):1-8. Farm-to-School, Impacts, Local Food Systems, Fruit and Vegetable intakes, GAP Certification. In 2011, the State of South Carolina was awarded grant funds through the Center for Disease Control (CDC) to implement a statewide farm-to-school pilot program. The Departments of Education and Agriculture partnered on this project and since then, 13% of public schools (160 of 1,200 schools) have participated in the program across the state. This pilot established several specific requirements, including: 1) serve at least two South Carolina grown produce items per month during a school meal; 2) promote South Carolina Grown produce in the school cafeterias; 3) include nutrition and agriculture education in classroom curriculums; and 4) install school based gardens or farms . The farm-to-school pilot program in South Carolina is in need of an effective evaluation process to identify the overall economic impacts of the program, and the purpose of the study here is to expand and improve upon previous evaluation efforts through direct application of expanded methodology. The findings shed light on the difficulty of evaluating any impacts associated with farm-to-school purchasing, but ultimately allow for the development for effective evaluation of such programs. A review of evaluation efforts touts the benefits of farm-toschool programs. Short-term studies suggest positive outcomes regarding increased fruit and vegetable consumption both at school [1-10] and at home [8-11]; increased knowledge of nutrition, food, and agriculture [9,11-13]; educational achievement in core subjects, long-term increases in social activities and self-esteem [9,14]; and economic development through increased school meal participation by students and staff [2-7,11] and increased direct sales for producers [5-7,14]. Some observers argue that integrating lessons covering food growing, nutrition, cooking, and garden planning into science and math or other curricula is key to creating lasting impacts among students from farm-to-school activities . However, many of these studies are evaluation reports submitted to funding agencies. One comprehensive review of farm-to-school impact studies found that out of 38 evaluation reports, only 15 described methods for gathering data . A hypothesized essential component of successful farm-toschool purchasing programs is the use of local foods and emphasis on “place”. Student engagement, increased fruit and vegetable consumption, and educational attainment are contributed to increased understanding of how food is grown and where it is grown, and a sense of connection to the people and places associated with the food items [2-5,8-11]. Yet most farm-to-school programs are in their infancy and limited resources have constrained evaluation efforts, thus conclusions are hard to draw without greater sales volumes and further well-executed, long-term, longitudinal studies . In order to better evaluate the efficacy of these programs, longterm studies that rely on robust record keeping are needed. Two previous studies have addressed impacts of farm-to-school activity in South Carolina to date, and they are representative of other efforts in communities across the country. The main limitation of approaches taken by these economic impact studies is the tracking, obtaining, and utilizing of appropriate, primary data by primary stakeholders in the pilot programs. For example, the first of these South Carolina studies estimates an annual economic impact of $28,429 in 2011-2012 and an economic contribution of $52,762 in 2012-2013, based on an assumed fruit and vegetable budget of $0.15 per student, per meal, for two meals a month across 52 participating schools and using economic multipliers from a study conducted in Minnesota [18,19]. The second study used these same cost projections and multipliers to estimate additional economic impacts on the crop production sector of South Carolina’s economy using an Economic Modeling Software Inc. tool . These two studies relied on quantitative estimations, projections, and models drawn from data covering large geographic regionsat times this includes county level data but sometimes national in scale. This makes it difficult to project with certainty the impacts realized at the local level, or to further estimate any meaningful returns on investment [16,18]. To prove this point, three school districts represented by these previous impact studies were asked to provide data to verify purchases made during their participation in the pilot project and none could do so. After many months, one school could produce some records, but the provided records likely only represented a very small fraction of their farm-to school purchasing efforts and fell short of the impacts that were attributed to them by previous studies. Verification of these previous studies was also attempted by consulting with the Food and Nutrition Services (FNS) of the USDA. It conducted the first farm-to-school Census in 2013 for schools participating in farm-to-school efforts during the 2011-2012 school year, which was the initial year of the South Carolina statewide pilot project. A second Census was conducted in 2015 to address farm-to-school activities during the 2013-2014 school year. Participation in the survey was voluntary and responses are likely only estimations, not real, recorded values. Responses to the Census did not correlated to previously estimated impacts nor align with data collected over the course of this present study. Given these limitations, the present study sought to devise methods for compiling actual data on school food spending and sourcing on a more consistent basis so that actual purchases could be analyzed across participating school systems. The first step taken was to investigate current data practices at selected school sites, and then to propose mechanisms for future data collection that could be applied at any school system in the state. This paper outlines results from the investigation of available sales information, data collection capacities, and distribution channels for local produce purchased by three contiguous school districts in South Carolina. It explores similar questions from the perspectives of distributors and farmers since school districts are only one part of the school food supply chain and the economy. Further, it suggests future strategies that might be implemented in any school district and identifies barriers to local purchasing, including policy considerations and infrastructure needs. This farm-to-school purchasing study followed an in-depth evaluation of the South Carolina food system, which entailed 153 qualitative interviews with stakeholders identified initially by an independent steering committee and then using a “snowball” approach, and a non-representative survey of 60 specialty crop producers . This previous study laid the foundation for understanding the intricacies for farm-to-school purchasing in the study region. 1) Prevailing food purchasing and data collection practices within the school districts. 2) How farm-to-school purchasing programs are actually being implemented. 3) How farm-to-school programs are being evaluated at the farm, distributor, and school level. 1) How do you define local food? 2) How do you track purchases and/or sales of local food? 3) How much local food have you sold to area schools and/ or how much local food have you purchased? 4) Can we see your records? When interviewing schools, we also asked about prime vendor contracts and restrictions. To add broader perspectives, selected national experts were asked to help identify promising practices used in other contexts, as well as key issues encountered. These interviewing strategies were selected because of the small number of sites to be studied, and the goal of capturing the unique qualities of each site. Quantitative data reported through interviews were crossreferenced with the USDA’s Food and Nutrition Services farmto- school census, menu production records filed by each school with the South Carolina Department of Education (SCDE), and purchasing invoices. For the purposes of the state sponsored farm-to-school program, the definition of “local” used by governmental agencies is “grown in South Carolina”. The definition of "local" varied across the school districts. One school district defined “local” as within the state, one defined “local” as within 50 miles of the district, and the third district didn’t define “local” at all . Still, this study discovered that, despite these broader definitions, actual direct farm-to-school purchases came from farms located at least within the county of the given district, and often very close to the school campus. Additional interviews showed that the state’s produce distributors had their own definitions as well. One distributor assigned a specific lot number designating “local food” to products grown within South Carolina, or within 250 miles of its warehouse. Another distributor defined “local” to mean within 120 miles of its warehouse. However, in practice, these definitions did not hold up-one distributor readily provided a list of “local” foods that were purchased from South Carolina vendors, but the distributor could only verify that half of these items were actually grown inside the state. This indicates that schools may be depending on distributors to deliver “local” products to comply with farm-to-school program requirements, but have no way of knowing for sure that the products meet any of these definitions of local. Interviews showed that, although school districts are participating in the SC Department of Agriculture’s farm-toschool pilot program, some of these schools have been pursuing local food procurement on their own for quite some time. As a result, their systems for purchasing and tracking are already entrenched. Not surprising, then, purchasing efforts and data collection capacities varied widely across schools within the three districts. However, all the interviewed food service staff expressed the same motivations for participation- to source higher quality, local food either through their preferred vendors or directly from farms. Each of the three examined school districts pursued a different approach. One school, operating under the “sole-source” exemption (under which a school can purchase an item outside of their preferred vendor contract, if the seller is the only provider of that product), purchases as much produce as it can from the only GAP-certified (Good Agricultural Practices) farm in its county. In the 2012-2013 school year in which the district spent $325,000 buying produce from all sources, $25,000 (7%) was purchased from this sole-source GAP-certified farm. In a neighboring school district, the school food service program purchased produce from the school garden, which is rapidly expanding in scale under dynamic leadership. This garden is also considered a sole-source provider as it is the only GAPcertified operation in its area; however, the produce supply is limited by the output of this school program, which has limited access to land and other resources. In the largest school district, ensuring that all schools get high quality and traceable produce was of utmost importance, yet this district reports that 2.5% of their food budget is spent on items produced within the state . Moreover, despite their interest in sourcing foods locally, school food service staff reported that several factors interfered with their efforts. Limitations in staff time and inadequate storage capacity led the list of concerns, but the bidding process itself was also noted as an obstacle. Even though each district utilized a different local procurement practices, some records of local purchasing efforts by schools directly participating in the SC Department of Agriculture’s farm-to-school program were identified. Consistencies in record keeping amongst the schools were found in two areas: food production records and purchasing invoices. Food production records, also more commonly known as menu production records, which the South Carolina Department of Education (SCDE) mandates in order to track school food nutrition standards compliance. The reports list the menu items served, the number of servings, and other nutritional and food preparation details for each meal. Schools participating in the SC Department of Agriculture’s farm-to-school program also denote which of these products are considered South Carolina grown, typically as a handwritten notation after the food production record has been produced. Completed forms are sent to the district school food manager, and then filed and housed at the school district office in case of a USDA audit. Sometimes PDFs of these individual forms are sent to the SCDE on a monthly basis, otherwise paper copies are collected during SCDE staff visits. For the purposes of monitoring the SC department of agriculture’s farm-to-school program, PDF copies of production records are sent to researchers at Clemson University. There is currently no digital system for compiling a database of the data provided on these records. Schools also keep additional records that are separate from the mandated food production records. Each school is supposed to retain invoices from farms and distributors that show exactly what was purchased. In the past, the SC department of agriculture’s farm-to-school program has required that these invoices be attached to food production records. Yet at the interviewed schools, these invoices are paper copies kept in a file folder. One of the schools interviewed for this project was able to rapidly print out several invoices from their local, “sole source” producer, but not from their broadline distributor. Combing through these invoices to produce a summary of purchasing was considered both tedious and unfruitful by the school food service staff and program evaluators alike, thus no comprehensive collection of this information is performed. Distributor-generated invoices did not delineate South Carolina grown products from others, so anyone wishing to know this for program evaluation purposes must investigate on their own. These invoices are typically generated monthly, if not on an even longer time horizon, and may be delayed in arriving at the school. Sources indicated that it was often difficult for them to locate the “right invoice” to identify which foods were purchased for the two servings required under the SC Department of Agriculture’s farm-to-school program. Schools and districts have limited purchasing options in South Carolina. One large broadline distributor serves as a preferred vendor to all school districts in the South Carolina school food service purchasing alliance. This Alliance was formed in 1999 as a non-profit organization. As of 2008, it had 74-member districts, representing 88% of the state, with a combined purchasing power of $90 million . This alliance aims to increase the purchasing power of member school food authorities, and both facilitate and manage the bid process. Although the alliance allows for greater efficiencies and cost savings, many food service staff, distributors, and farmers feel that the alliance creates barriers to local purchasing, and limits distribution options. Interviewed food service officials believe that the large, preferred vendor is required to source South Carolina grown products whenever possible, however they saw little evidence that the firm exerts any extra effort to fulfill this requirement. Researchers were told that the distributor does not provide schools the information they seek showing the source location of the products they sell. Under alternative agreements with the department of defense, two smaller distributors have contracts to distribute to certain schools in this three-school-district area of interest. Through the South Carolina department of social services after school snack program, a third smaller distributor delivers local product to nearby schools. Additionally, through “sole source” exemptions, schools can source directly from farmers for limited purchases through this program. One of these smaller distributors has been sourcing produce and products locally and internationally and distributing it to Charleston area businesses for 70 years. This distributor regularly serves Charleston County School District, among others. The interviewed staff reported a strong willingness to respond to consumer demand for more local items and the firm already works directly with many local farmers. However, these staff reported that distributing to schools and buying from local farmers is difficult. A second small distributor buys exclusively from farms within 120 miles of Charleston. Part of this distributor’s mission is to break through obstacles by providing training and educational opportunities to local producers, as well as umbrella insurance and group GAP coverage. Despite being better prepared to facilitate local purchasing and local distributing, this distributor is excluded from the school lunch market due to the preferred vendor contracts mentioned above. It is nonetheless able to participate in school snack programs and other, independent school initiatives. This firm expressed strong interest in selling to schools once contracts are renegotiated in the future. Tracking local purchases by and distributions to schools should be increasingly possible due to traceability requirements in the Food and Drug Administration’s (FDA’s) new Food Safety Modernization Act and current GAP Certification standards. As these new requirements are rolled out, produce will be traceable from the specific field where it was grown to the point of final distribution to the consumer, to facilitate tracking in the event of a foodborne illness outbreak. Large distributors currently track such source information, but do not readily make this available to purchasers. Over the course of this investigation, distributors were asked to share several different data reports regarding their local purchasing and sales to schools. All of these requests were willingly accommodated, but results varied. For example, a monthly “sales to schools” report was easily generated. However, only one-line item had “South Carolina Grown” specifically called out in the line item description, even though local products are assigned different lot numbers designating them as local. To clarify, these different codes help the distributor track local items versus non-local items, however they do not help purchasers identify the local products. Another “local procurement” report listed items purchased from in-state companies; however, one major source included a selection of pineapple products and other items that are clearly not South Carolina grown. One mid-sized distributor expressed a willingness to share local purchasing information, and offered to continually supply data reports on a monthly basis if needed, however they said they would appreciate a financial incentive to do so. Strong interest was expressed by the distributors to provide this data, but after repeated attempts, company representatives were unable to allocate the staff time required to do so. Producers have mixed thoughts about the benefits of selling to schools, even though they were generally supportive of farm-toschool programming [1,6]. South Carolina has a great capacity to grow much of its own food, however, basic investments in infrastructure and training are needed in order to actualize local procurement . Identified barriers included the following: 1) a lack of GAP certification due to cost and/or lack of willingness to comply with GAP standards; 2) a lack of liability insurance coverage required by buyers, which new and beginning farmers often view as excessively costly; 3) an unwillingness to accept wholesale prices, especially for new farmers who need to establish a business; 4) a lack of ability or facilities for minimally processing foods for school cafeteria use; and 5) a lack of a local school based partner that is dedicated to farm-toschool programs. The few farmers that are selling to some schools typically do so for one of two reasons: 1) they have surplus products or “seconds” they can afford to sell at a lower price than they typically require from other market channels; or 2) they consider it an act of charity, knowing that they could get better prices from other markets. Many farmers that sell to schools expressed their support for education, or sought to generate good will that might lead to other sales. A select few have landed on a marketing strategy that means school sales really work for their particular business model. Interviews revealed that when schools and farms build close and trusting relationships, farmers are better able to plan and plant for school purchases. Indeed, several farmers in South Carolina reported changing their production plans to better accommodate school-based markets. These changes, however, come with great risk-the farmer faces the potential of losing his or her school market due to a new producer entering the market and eliminating the “sole source” exemption. When farmers sell their produce directly to a school, the farm must generate an invoice to receive payment. This is often a rudimentary data reporting mechanism sometimes consisting of nothing more than handwriting on scrap paper. Farmers also generate invoices when they sell to distributors, of course. Most farmers could tally their sales to local schools and/or distributors if they needed to, however they have little free time during the growing season. Many would be able at best to produce an annual summary of sales during off-season months, which may not be frequently enough for some evaluative purposes. It is inherently out of sync with the school-purchasing season. Although schools are seemingly the most likely source of all data needed to measure the impacts of farm-to-school programs, school food service providers are not currently well equipped to report local food purchasing and farm-to-school programming data. They are typically limited to what distributors offer them in regard to products the origins of those products. School food service staff do not readily have time track down needed information and to file such reports. Furthermore, no standard reporting protocol currently exists in South Carolina for tracking all local food purchases, leaving the state lacking enough information to conduct a robust program evaluation and economic impact assessment. Not only do different school districts have distinct protocols for documenting food service activity, methods sometimes vary from school to school within a given district. Few schools have devised consistent methods for distinguishing local purchases from nonlocal ones if the names of the sourcing farms are not provided on vendor invoices. 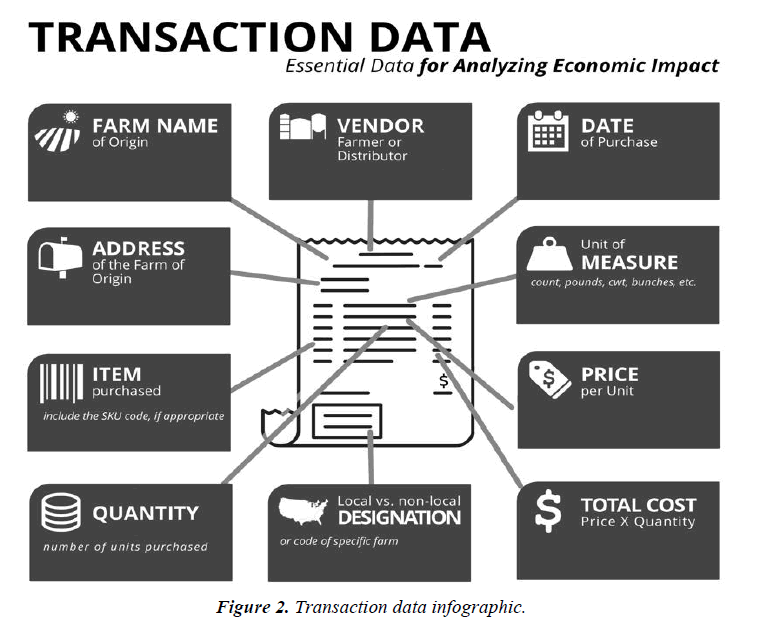 A rudimentary reporting mechanism does exist in the form of the food production record, however since the original purpose of these records was not to collect data for farm-to-school program evaluations, these records do not fulfill the data needs of a primary economic impact assessment. In theory, these production records could be used to estimate farm-to-school purchasing-the number of servings listed on each production record could be converted into an estimate of pounds served, which could be used to roughly estimate the value of local foods purchased- yet this is an inexact, laborintensive process. In practice, such calculations only tell part of the story. As mentioned above, coding of “South Carolina Grown” is imperfect, and potentially trivial. Moreover, for farm-to-school programs wishing to document an impact on local community development, further detail may also prove important. Purchasing carrots from a single farm that grows 200 acres of the vegetable with mechanized cultivation will reap a different impact than purchasing the same quantity from 40 separate five-acre farms that rely upon hand cultivation and local labor. To address this complexity, it is advisable that school purchasing records retain information about the actual farm that produced a given product, or any processor that may have prepared a given food item for the school nutrition program. In addition, maintaining a registry at each school of the farms where food is purchased allows food service directors to more readily identify what production practices were in place at each farm. Given proper funding, data collecting and reporting capacities could be strengthened at the school level. Yet even if record-keeping systems were improved, this research indicates that considerable obstacles would still remain to compiling comprehensive databases. Food service staff work under severe time constraints with extremely limited resources, and justifiably place a higher priority on food preparation than on data entry. Many staff have limited access to computers, and limited knowledge of data entry practices. More critically, school food service staff emphatically asked not to be tasked with any additional responsibilities. Under current regulations, schools must put out their contracts for public bidding and accept the lowest priced bid that still meets the requirements outlined in the request. At this time, contract requirements and resulting bids favor large-scale distributors that serve many schools and other large purchasers across many states. This limitation confines the schools to purchasing only what the large distributors have available, which means they rely solely on whatever information the distributors make available. This seriously hinders both the possible beneficial impacts of farm-to-school purchasing and the ability to evaluate these impacts. Food distributors are often viewed as a suitable source of information since they have massive recordkeeping systems in place, and solid reasons to report on local sales. Yet, interviews for this project found that many distributors maintain two separate internal tracking systems-one database keeps track of items coming in and another keeps track of items going out. Integrating these into a single reporting process would require considerable expense. Furthermore, relying solely on what distributors report may skew the data because their proprietary interests as vendors may not totally align with public interests. Arguably the transaction with the strongest community impact (and perhaps the strongest pedagogical impact) is direct sales from farms to schools. Furthermore, tracking local food purchases is far easier when schools purchase directly from the producer, assuming the farm sells only its own product, because the source is automatically identified on the invoice. Yet these may also be individual, hand-written, paper invoices that end up in a file drawer. While some farms have exemplary recordkeeping systems, others do not. Many have difficulty doing any paperwork at all during the crop season. Direct payments could be paid to farmers that post these sales records to an internet reporting site, but the cost of such incentives may be steep compared to the potential benefits. In summary, local food purchasing efforts by the distributors and schools interviewed for this study are limited, however, their capacities to track these efforts are even more constrained. It would appear most efficient to create a unified electronic data entry platform which farms, distributors, and schools could use to enter school purchasing data; this could more easily be converted into summary reports that could be conveyed to parents, state, and federal officials, as needed. Interviewed software consultants added that if local foods data entry becomes integrated into routine ordering procedures, it is far more likely to be completed than if farmers and food service workers are asked to enter a separate data system each time they document local food trade. Ensure the farm identity is known to the end consumer: The USDA’s official definition of 400 miles or within the state of production is useful for policymaking, but has been met with much resistance from community practitioners given that this distance includes areas most people would not identify as their local food shed. The New Oxford American Dictionary’s definition of “locavore” as a person who consumes a diet of food grown within a 100-mile radius is more widely accepted, receiving popular attention in the 100-Mile Diet and Barbara Kingsolver’s book Animal, Vegetable, Miracle in 2009, to name two [24,25]. In some communities, however, “local” might mean “within my valley, or “within my county.” Many local food leaders in more densely settled areas consider “local” to be within a 30-minute drive, or within a 50-mile radius. Gary Nabhan used a 220-mile radius in his book, Coming Home to Eat in 2009, to highlight that in a sparsely populated desert area, widely scattered local options might range from edible cactus, to rangeland livestock, to Mexican seafood . These varying definitions of “local” can make any data tracking impacts difficult, especially if it is considered a binary question (i.e., local or not). Thus, the primary recommendation is that the identity of each individual farm that supplies food be preserved across the entire supply network. This is the step that will do the most to create a transparent process with great integrity, accommodate diverse definitions of “local,” and lead to the most robust evaluation possible. With proper labeling and product tracking in place, the tracking of sales and the reporting of this information can better executed for evaluation and research needs. Change production records form and reporting mechanism: Since the production records form and reporting requirement is already in place in public schools, this system could be revised to additionally serve the needs of farm-to-school programs. A few changes to this system could provide some improvements; however, this system will likely never be able to serve all the data requirement needs of a full assessment and evaluation effort. One potential change includes developing an electronic reporting mechanism through an internet portal- this will reduce the amount of paper shuffling required to compile the information and increase the efficiency and effectiveness of evaluations and audits. It will also inform additional research projects. These changes will not by themselves create economic impact assessments, but they would establish a data foundation for future pursuits. Establish a baseline and collect data for analyzing impact: Impact calculations can only be made by comparing conditions at two different points in time. This means that establishing a solid measure of initial conditions (a baseline) is critical. For schools with comprehensive records, this can be done retroactively. For example, a school with solid data sets may decide to use the 2000-2001 school year as their baseline if farm-to-school efforts were introduced the following year. For schools without complete records, which is most schools, the baseline will be the first year in which adequate data is collected. Further, any time a local purchasing program is being assessed, it is important to recognize that some local purchasing had been taking place already, prior to the introduction of the new initiative, even if the school purchaser was not aware of the source. Fluid milk is most likely to have been continuously purchased from a relatively local provider. Not properly accounting for this previous activity leads to an inflated impact number: the gross impact, instead of the net impact . Though impact can be calculated in a number of ways with a variety of models, the same basic data is required for most methodologies. An evaluator or analyst will want to compile a basic profile of every school food service or purchaser, as illustrated in Figure 1. Each purchaser or food service site will then want to collect the information outlined in Figure 2 for each transaction. These best practices allow for more thorough economic impact assessments. Other indicators aligned with programmatic goals could be added. Figure 1: Purchaser data infographic. Figure 2: Transaction data infographic. Offer farm-to-school sales rebates for data reporting: Once traceability and record keeping protocols have been ensured, it will be possible to provide incentives for local farmers to sell products to local schools, and simultaneously document those sales. This could be accomplished through (as one example) a sales rebate or a tax break proportional to total annual sales to schools. This incentive would not only encourage farmers to sell local product to local schools, but it would also help compensate farmers for accepting the opportunity costs of selling at a lower price upfront to the schools while also creating a data reporting mechanism for local sales to local schools through the application process. In order for farmers to receive these rebates, they would have to report their sales to schools, preferably through an internet-based platform that fed a farmto- school database. Distributors would receive strong financial incentives through the market- they would be able to sell more local food to farm-to-school programs. However, it would be ill advised to incentivize distributors more than farmers, since this would mean offering incentives to those who trade food products, already in a more favored position in the economy than those who take on the risk of producing the food in the first place. Thus, a rebate or tax-break incentive offered to farmers for selling local products to local schools could be an interesting policy approach. This would result in the data required to document farm-to-school purchases being collected by the state when farmers apply for their rebates. Reform the school food bidding process: Large distributors gain a competitive edge in serving a majority of schools due to their size and established business presence. In a competitive bidding process, they can often offer lower bid prices, and these firms are intimately familiar with the regulatory and safety requirements that schools face. They also offer food service staff a single portal for placing a variety of orders. One school food service staff member expressed a strong need to reform the bidding process to make bid efforts more collaborative and comprehensive, thus allowing for more school-to-school flexibility. This person cited examples from other states that allow school alliances to negotiate prices with producers and manufactures directly, leaving distributors to facilitate delivery only. Active bidders could also be required to source locally and report relevant data. Additionally, forward contracting has increasingly become an accepted strategy for schools to pursue in buying direct from farms since the time our research was carried out; this, too, offers great potential benefit by reducing uncertainty for both partners. Funding for this project was provided by The Boeing Company. Center for Food and Justice, UEPI; Occidental College. Riverside Farm to School Demonstration Project: Final Grant Report. The California Endowment. 2006. Feenstra G, Ohmart J. Compton farm to school demonstration project, Final Report: July 1, 2004-June 30, 2005. University of California Sustainable Agriculture Research and Education Program. 2005a. Feenstra G, Ohmart J. Yolo county farm to school evaluation report. University of California, Agriculture Research and Education Program. 2005b. Feenstra G, Ohmart J. Yolo county farm to school evaluation report. University of California, Sustianable Agriculture Research and Education Program. 2004. Joshi A, Azuma A. One-year evaluation report: Fresh from the farm program implementation at Lozano bilingial and International Center School. Center for Food and Justice to Seven Generations Ahead. Center for Food and Justice to Seven Generations Ahead. 2006. Schmidt M, Kolodinsky J, Symans C. The Burlington School Food Project, Final Evaluation Report. Center for Rural Studies, Vermont, Burlington. 2006. Christensen H. Juanamaria Healthy Schools Project Final Evaluation Report. Venture County Superintendent's Office. 2003. Murphy J. Education for sustainability: Findings from the evaluation study of the edible schoolyard. Massachusetts General Hospital, USA. 2003. Triant S, Ryan A. City of Wyoming parks and recreation summer 2005 programming evaluation: A report on Mixed Greens. City of Wyoming, MI, USA. 2005. The Food Trust. Kindergarten Initiative Evaluation Report. The Food Trust, Philadelphia, USA. 2007. Joshi A, Azuma A, Feenstra G. Do farm-to-school programs make a difference? Findings and future research needs. J Hunger Environ Nutr. 2008;3(2-3):229-46. Truong, P, Williams J, Griffin S, et al. South Carolina farm to school program: Economic impact and potential market for expansion. Clemson University. USA. 2013. Holland JH. Farm to School (F2S) programs: An economic impact analysis of South Carolina. 2014. Smith A, MacKinnon J. 100-mile Diet. Random House. 2007: ISBN 0679314822. Kingsolver B. Animal, vegetable, miracle. Harper Collins, New York, USA. 2009. Nabhan GP. Coming home to eat: The pleasures and politics of local food. WW Norton and Company, USA. 2009. ISBN 978-0-393-33505-7.